Rogers BlackBerry Bold is pricey | BlackBerry Blast! 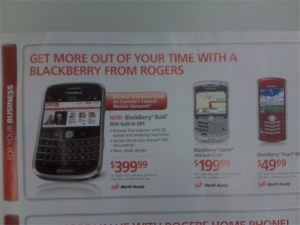 The Rogers version of the BlackBerry Bold has its price. Without a contract it will set you back a whopping $649. With a 3-year agreement it will set you back $399. These prices seem quite high for this device, and could cause new BlackBerry converts to look at devices like the BlackBerry Curve, or look elsewhere. While Apple is dropping the price of their iPhone, RIM is hiking the price of the BlackBerry. What's up?